Do you know how to explain the brain to yourself? We are at a time in our history when the head-long rush into the future can be nothing short of blurringly blindingly brilliant. How does one make sense of all the details of the rEvolution that life throws us into? As you rush towards the event horizon like an astronaut making a crash landing on a strange planet . . .when do you have time to stop and consolidate your understanding? To make sense of your tapestry of experiences? Among other things if we know how to operate the brain more effectively we can make the journey a tad more manageable. And in the evolutionary game of life a slight edge can of course make all the difference to our outcomes. Apparently that edge leading to rEvolutionary outcomes may be found, in part, in the brain. Was fortunate enough to attend a one day workshop with Dr Favardin Daliri – CEO of Tabarsi – at the Inspiration Garden on the weekend. He was presenting the mysterious science of both Quantum Theory and the new Science of the brain with a good helping of the spiritual dynamic thrown in. It seems that, given the massive emergence of this kind of consciousness with forward thinking people . . .this is what the future is going to look like. Integrated science and spirituality. What nuggets of GOLDEN understanding and enlightenment did we discover? Well look . . .on the one hand we might say that it’s nothing we haven’t heard before, but in fact perspective and sequence is profoundly important to our perception. Dr Daliri puts together the material for this emergent holistic understanding in a way that is quite excellent, and that excellence includes useful. The power of emergent phenomena is the power to transform the world. That’s the news from Chaos Theory . . .the Butterfly Effect. So what did Dr Daliri say? 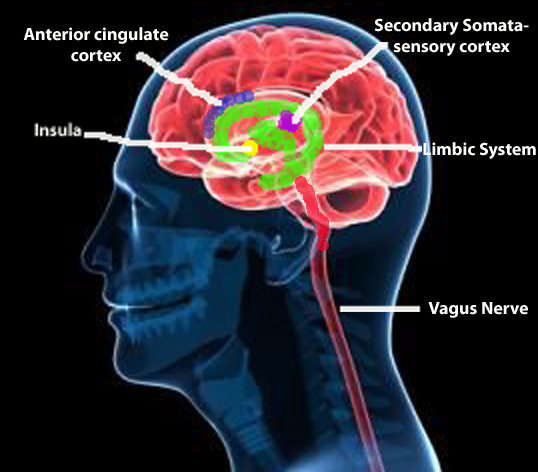 The limbic system is the ancient part of the brain that is concerned with the adrenalin rush of fight or flight. There’s a whole bunch of glands and sections in there that equate to the animal side of our nature. The chest thumping, the high octane responses to kill or be killed, the outlandish and unintellectual primitive rituals of belonging – just like the American election campaign – these are all being driven in and from the ancient part of our brains that is concerned with survival, fighting and putting on a display of aggression. But there is a higher side to our nature which may be thought of as having a home base in the frontal lobes, which are in fact very large. They are the big pink bits in images that you see wrapped around the (primitive and smaller) complex that sits on top of the brain stem. When you get stressed basically the old animal part of our brains can all too easily hijack our whole life with a stress session to rival knowing you are having dinner with your new in-laws. Not stressful enough for you? OK you just got a bill from the tax department for twenty thou. Yep. That’ll do it. And the problem is (according to Dr Daliri) that your whole state of conscious being tends to go into a negative spiral of panic, stress, worry and maybe even something that may look like hopeless despair. The popularity of Yoga and meditation not to mention booze and tranquilizers is easy to understand in this light. In a stressed out state it’s hard to think straight, eat right or do what needs to be done to deal effectively with whatever reality you might have playing. According to Dr Daliri one important part of your strategy must be to get out of the stress reaction and to do this you need to find a way to by-pass the limbic system – for A TIME. You need to shut down the brain computer of stress which has gone into a spiraling out of control sequence. Instead focus on something pleasant, pleasurable and comPelling. This short-circuits the stress reaction and gives you an opportunity to re-pattern the sequence thus leading to vastly more positive outcomes. Of course we are, at any time, at liberty to bring the great spirit into the equation. Call on the Quantum Goddess to calm the quixotic quagmire, pray to the infinite almighty for re-alignment, ask Jesus to jolly well jump in jubilation of your future successes. Bat the ball to the Buddha of brilliant beauty. Stand tall in the garden of Spiritual Science and supplication. Vision the blessed outcome you desire as a done deal and say THANK YOU. And hey . . . you might as well eh? By the way . . .Dr Quantum’s Lime Flavoured rEvolution suggests that a very powerful method to achieve the limbic by-pass would be to IMAGINE doing something pleasurable and to bring the spiritual INTO THIS IMAGINING. That’s my hot tip for de-stressing. IMAGINE playing the piane. IMAGINE surfing a wave. IMAGINE being on the beach in a tropical paradise. You get the picture and bring in the God of your understanding. He/She will not mind a bit. Invite the spirit. Then come back to the challenge with a fresh perspective and with Mother Mary in your corner. You might as well eh?!! The simple spiritual formula is to ask for help on a metaphysical level. Just tell your ego to get with the program . . . and give it a go. All together now . . .